Since its introduction in OS X 10.6, support for AppleScriptObjC has grown significantly. Since OS X Yosemite, it is available everywhere, all the time. 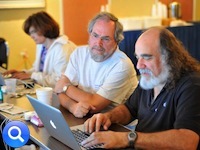 This is the place to find tools and documentation to help take advantage of this powerful AppleScript resource. AppleScriptObjC was introduced largely as a replacement for AppleScript Studio, as a way to develop AppleScript-based applications with a rich interface in Xcode. Subsequent releases have made it increasingly more accessible to regular scripters. Not every script needs a complex interface, and not every scripter wants to master the complications of Xcode. AppleScriptObjC offers abilities most scripters want in their standard AppleScript applets or scripts. 'Everyday AppleScriptObjC' looks at AppleScriptObjC from this perspective: how to take advantage of this great resource in your everyday scripts. 'Everyday AppleScriptObjC', Third Edition is the ideal introduction for scripters wanting to use AppleScriptObjC in El Capitan, Yosemite and Mavericks. Read more here. My free script libraries, including BridgePlus, PrefsStorageLib, Metadata Lib, SQLite Lib, CalendarLib, CalendarLib EC, FileTagsLib, FileManagerLib, Dialog Toolkit Plus and Myriad Tables Lib are now listed together on their own page. Read more here. AppleScriptObjC Explorer 2 works with versions of the OS from 10.6 to 10.8. It's the ideal AppleScriptObjC editor for those yet to upgrade or who have to support older versions of the OS, with code-completion based on the older underscore-based syntax. AppleScriptObjC Explorer 2 is now free. Read more here. ASObjC Explorer 4 has been discontinued. Read more here. Myriad Helpers is a free collection of Objective-C files that simplify some of the coding involved in AppleScriptObjC in Xcode projects. Read more here. AppleScriptObjC has become much more accessible in Mavericks and Yosemite, but users of earlier systems don't need to miss out. ASObjC Runner is a background application that can be used to run AppleScriptObjC scripts. It also provides a host of vanilla scriptable commands that fill many of the holes in vanilla AppleScript. It runs on OS X 10.6 up to Mavericks, and it's free. It may run under 10.10 and 10.11, but it definitely will not run under 10.12 Sierra.Read more here. 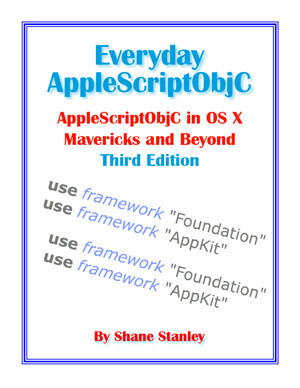 Everyday AppleScriptObjC, Third Edition by Shane Stanley is the perfect introduction to AppleScriptObjC scripting in Mavericks and later. This new edition covers the changes introduced in El Capitan, and contains several new chapters. BridgePlus is a free script library for use under OS X 10.9 and later, designed to improve and simplify the use of AppleScriptObjC. Read more and download it here: BridgePlus Script Library. ASObjC Runner is a free application that lets you run scripts that include AppleScriptObjC code from script menus/panels/launchers, and works in versions 10.6 thru 10.9. Now includes a range of “vanilla” scripting commands for non-ASObjC users. Read more and download it here: ASObjC Runner. These helper files can greatly simplify using some Cocoa classes. Read more and download them here: Myriad Helpers. 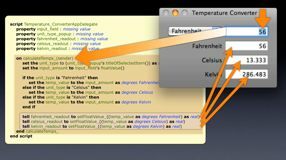 A video demonstrating the connection of application interface elements to their corresponding AppleScript function code using Interface Builder outlets and actions. More here.